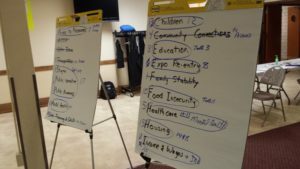 We begin to narrow our focus from an extensive list of poverty issues to identify those themes Summit participants would like to explore more in-depth. Session #3 includes first steps in forming Action Teams, reviews the One-to-One Relational Meeting, and introduces the Values House Core Practice. At Session #1, participants identified Issues & Challenges associated with poverty and income insecurity. These issues were grouped into 17 Themes. At Session #2 participants were able to review and elaborate on issues within the 17 Themes. During Session #3, each participant will choose one Theme to explore further, and we will create small groups based on those similar interests. We are starting to build Action Teams! Next came table shuffling as participants relocated to sit with others in their new Action Team. They introduced themselves, shared contact information, and conducted One-to-One Relational Meetings. The One-to-One meeting is a core skill in the Clear Vision Process. It helps to discover another person’s interests and passions; to learn about their stories and what motivates them. The result is that One-to-One’s can be very useful in creating public relationships. 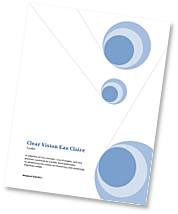 Learn more about One-to-One meetings in the Clear Vision Tool Kit. The next agenda item – Values House Meeting – is a Clear Vision Core Practice that can help teams build a shared commitment toward civic values. What are the threats or forces that endanger these values? How can we address those threats; what are our opportunities? Table notes from the Values House Meeting discussions (Values, Threats, Opportunities) will be recorded and brought back to review at Session #4. Session #3 ended with participants sharing the one-word evaluation of “what went well for you this evening?” with others in their Action Team.